It is critical to identify the species of destructive termites to formulate an appropriate control program. 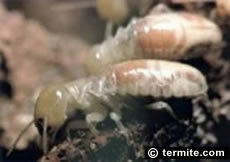 There are four main species of destructive termites in Florida. AREAS OF HIGH RISK IN FLORIDA include Altamonte Springs, Apopka, Aventura, Boca Raton, Bonita Springs, Boynton Beach, Bradenton, Cape Coral, Casselberry, Clearwater, Coconut Creek, Cooper, Coral Gables, Coral Springs, Dania Beach, Davie, Daytona Beach, Deerfield Beach, De Land, Delray Beach, Deltona, Dunedin, Fort Lauderdale, Fort Myers, Fort Pierce, Fort Walton Beach, Gainesville-FL, Greenacres, Hallandale Beach, Hialeah, Hollywood, Homestead, Jacksonville Beach, Jacksonville-FL, Jupiter, Key West, Kissimmee, Lakeland, Lake Worth, Largo, Lauderdale Lakes, Lauderhill, Margate, Melbourne, Miami Beach, Miami-FL, Miami Lakes, Miramar, Monticello-FL, Naples, New Smyrna Beach, North Lauderdale, North Miami, North Miami Beach, North Port, Oakland Park, Ocala, Ocoee, Orlando, Ormond Beach, Oviedo, Palm Bay, Palm Beach Gardens, Palm Coast, Panama, Pembroke Pines, Pensacola, Pinellas Park, Plant, Plantation, Pompano Beach, Port Orange, Port St. Lucie, Riviera Beach, Rockledge, Royal Palm Beach, Sanford-FL, Sarasota, St. Cloud-FL, St. Petersburg, Sunrise, Tallahassee, Tamarac, Tampa, Tarpon Springs, Temple Terrace, Titusville, Vero Beach, Wellington, Weston-FL, West Palm Beach, Winter Haven, Winter Park and Winter Springs. Area of Distribution: The Formosan subterranean termite (Coptotermes formosanus) has now become established in Florida and other southern states. At least one colony has been found In California (1995). Formosan termites are a serious timber pest in Hawaii and coastal regions of Texas, Florida, Louisiana, Mississippi, Alabama, Tennessee, Georgia, South Carolina and southern California, as well as, inland towns and cities. 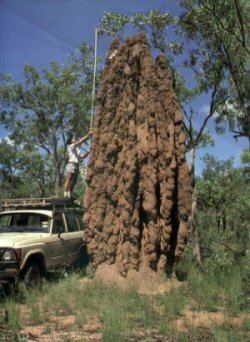 Area of Distribution: Cryptotermes drywood termites are found mainly in the humid coastal areas of the southern states of the United States from Virginia to Florida, through the desert southwest, along the Pacific coast to northern California and in Hawaii. Cryptotermes drywood termites are sometimes discovered in other states after being transported in furniture or other timbers. Cryptotermes drywood termites eat across the wood grain and make chambers or galleries connected by tunnels. Other signs of infestation include the presence of swarmers or their shed wings, piles of faecal pellets, termite plugs which seal all openings in infested wood, and surface blisters caused by older enlarged galleries very close to the wood surface. Occasionally they may build shelter tubes constructed of pellets cemented together to bridge over to an adjacent piece of wood. Biology and Habits: Cryptotermes drywood termites do not live in the ground. They obtain all the moisture required from the timber they infest. They do not require contact with the ground and do not build mud shelter tubes. Neotermes are common in the subtropical woodlands, mangrove forests, and urban settings of the coastal peninsula of Florida and the Florida Keys. Neotermes castaneus has the greatest distribution in Florida with its northern limits extending to Merritt Island on the eastern coast and Pinellas County on the Gulf coast. Inland infestations of Neotermes castaneus have been confirmed in Orlando and along the shore of Lake Okeechobee. The range of Neotermes jouteli extends from Vero Beach to the Keys, while Neotermes luykxi, a relatively newly discovered species, has been collected from eastern Broward County to Key Largo. Identification of Swarmers and Soldiers: Alates leave mature colonies via multiple dispersal flights over "swarming" seasons that can last for several months. Neotermes jouteli and Neotermes luykxi tend to disperse in the late spring or summer, while Neotermes castaneus has peak flights in the late fall or early winter. Flights occur at dusk or at night. 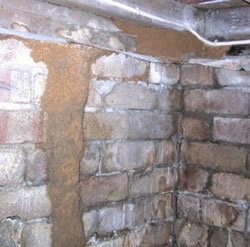 Dampwood termites are relatively strong fliers and, like most nocturnal flying insects, are attracted to lights. Porch lights, indoor lights, and video monitors often lure the alates inside, especially when doors and unscreened windows are opened. When alates are found indoors, their origin is usually from a yard tree or a woodland colony. Occasionally, alates found indoors originate from an infestation in the structure itself. However, alates flying indoors are unlikely to find the moist wood they need for successful colonization, and are doomed. A month or two before dispersal flights, nymphs with long wing buds appear and gradually molt into swarmers (alates). Neotermes swarmers are large and have two pairs of wings that are lightly creased along their vein paths. Fore wings and hind wings are about equal in size and shape. Each fore wing has five pigmented and enlarged veins near where they attach to the body. The enlarged median vein distinguishes Neotermes swarmers from all other termites in Florida. Neotermes soldiers from the same colony can differ substantially in size, but all are large (1/3” - 1/2" long) and have at least two marginal teeth visible on their left mandibles. They differ from other termites in Florida in that their pronotum is as wide as the head and, at the same time, the width of the pronotum is much greater than its length. Identification of Timber Damage: The limited conditions that support colonization by dampwood termites relegate these termites to minor pest status. Wood damage, however, can be severe after several years if infestations are left alone. Damage to trees and branches may cause weakening but does not appear to harm tree viability although hollowing from galleries might promote secondary fungal intrusion. These termites build networks of galleries that meander through the wood in which they are hidden. Biology and Habits: Neotermes castaneus, in particular, prefers to nest in living trees. Colonies are often discovered in trees when they are pruned or damaged by windstorms. Robust colonies of N. castaneus apparently live in trees and palms for years or even decades before they are discovered. In one case, alates of N. castaneus were emerging from a Ficus tree in an indoor shopping mall in New Jersey many years after the tree was delivered from Florida. Although the galleries may weaken trunks and branches, the overall health of the tree is usually not directly affected. The termites appear to limit their feeding to the dead xylem tissues while avoiding the cambium. Because these same conditions are conducive to fungal decay and subterranean termites, it is in the interest of the property owner to correct these moist conditions. Neotermes infestations can extend into sound dry wood several yards away from the moisture source, but once the remote source of moisture is removed, the colony will gradually decline and succumb to desiccation. 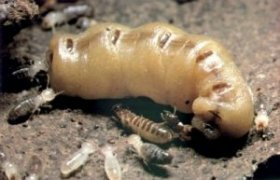 Like drywood termites, dampwood termites produce faecal pellets, but because of the moist conditions of the gallery system, the pellets loose their distinctive shape and form amorphous clumps or paste. The degree of shape degradation is directly related to moisture content.